Apophis is a 300 meter wide asteroid that caused a stir back in 2004. When NASA discovered the near-Earth asteroid (or NEO), it appeared to be tumbling in our direction Armageddon-style and the initial odds for a 2029 impact were 1-in-37. Understandably, people got scared, the media went nuts and astrophysicists were suddenly very interested in space rock deflection techniques. Fortunately for us, NASA has downgraded the threat to a zero (note zero) chance of Apophis bumping into us in 2029, and lowered the risk of a follow-up impact in 2036 from a 1-in-45,000 chance to a 1-in-250,000 chance. It’s important to note that NASA didn’t just pull these numbers out of a hat; the space agency has been tracking Apophis intently since its discovery, plotted its position and projected its location to a very high degree of precision. The more we watch Apophis, the more the world’s scientists are convinced that the asteroid poses a very tiny risk to life on Earth. In fact, giving anything a 1-in-250,000 chance of happening is more of a courtesy than a ‘risk.’ Granted, we’re talking about a global catastrophe should Apophis hit, but would you ever bet on those kinds of odds? Apparently, the Russian space agency thinks it’s more of a game of Russian Roulette than NASA thinks. Wait a minute. Does Perminov know something NASA doesn’t? Is he even referring to Apophis? You know, the same asteroid NASA has calculated that has a cat in hell’s chance of causing bother in 2036? And what’s this about the year 2032? Just for the record, Perminov is indeed referring to Apophis, but he got the date wrong (Apophis does not make a flyby in 2032). Perminov also puts a price on saving hundreds of thousands of people… “several hundred million dollars” should do it, apparently. On the one hand I’m impressed that Roscosmos is calling for some kind of anti-asteroid shield, but on the other, Perminov’s concern is terribly misplaced (and potentially damaging). His statement sounds as if he’s only just heard about Apophis and then thrown into a press conference unprepared, then asked what he’s going to do about this impending doom. Naturally, in that situation he would have blurted out the first thing that popped into his head: We need to save the world! However, this isn’t the first time he’d heard about Apophis. However, saving the world from a theoretical “dangerous object” that may or may not hit us for the next few hundred/thousand/million years is less likely to get funding that an imminent 2032… sorry, 2036 impact. Although Perminov might sound reasonable in asking for asteroid deflection funding, using sensationalist means to try to leverage funding only serves to make the same funding hard to come by. In the AGU 2009 meeting in San Fransisco last month, ex-Apollo astronaut Rusty Schweickart outlined his organization’s plans to deflect an asteroid should it pose a threat to Earth. The B612 Foundation points out that there is a ~2% chance of Earth being involved with an “unacceptable” collision in the next century (not by Apophis, but by another undiscovered asteroid), but Schweickart and his colleagues want to emphasize urgency, not panic. 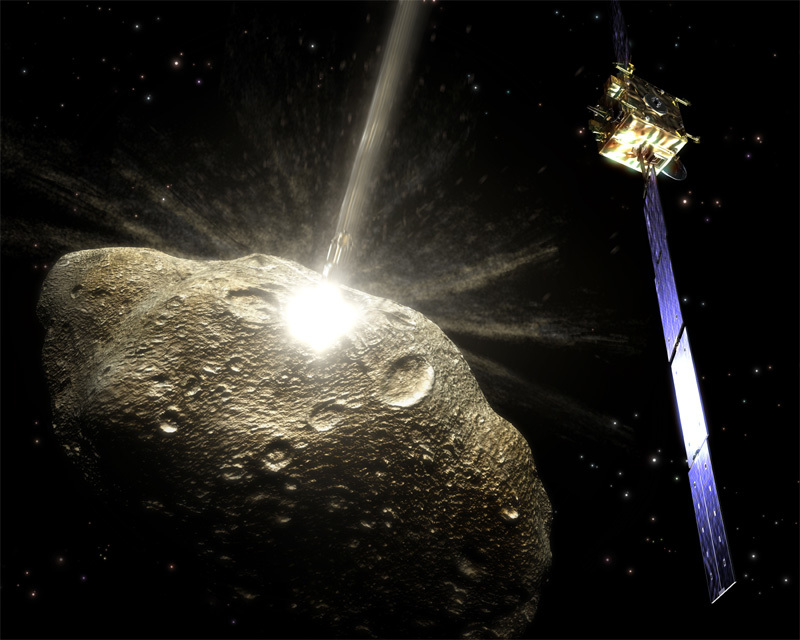 An infrastructure needs to be put in place to deal with asteroid deflection, but this goal will only be hindered by unwarranted alarm by the likes of Perminov. Asteroid detection and deflection will be two critical skills mankind will need to develop for the long-term survival of life on Earth, but the head of Roscosmos is running the risk of making the issue sound more like a crazed rant than anything of substance. I’ve always found asteroids to be fascinating. They are often surprisingly big, they contain a wealth of information about the history of the Solar System… and, let’s be honest, they’re frightening. There are thousands of asteroids out there, often collecting in clearly defined belts or gravitationally stable regions known as Lagrangian points. However, many are not so well behaved; they seem to have their own agenda, flying around the Solar System in their own orbits, sometimes buzzing the Earth. Fortunately, the vast majority of these rocks are harmless; if they hit our atmosphere they might create a dazzling light show, burning up, possibly even exploding as a fireball. Sometimes though, a big asteroid might be observed and astronomers become a little concerned. The next known threat that might hit us is the famous asteroid named Apophis that is expected to make an uncomfortably close encounter with Earth on April 13th, 2036. The odds of Apophis hitting us in 2036 (not 2029 as quoted in the above video) are 45,000:1, which may sound fairly unlikely, but if you start comparing those odds with dying in a plane crash, or being hit by a car, you’ll see that actually, a one in 45,000 chance are the kind of odds you’d happily quote when placing a bet in a Vegas casino. I have a chance! Yes, and there’s also a chance of a 350 metre-wide asteroid hitting us in 2036, so perhaps we should start planning for the worst? Fortunately, we have some lead time on Apophis, and we’ll learn more about the chunk of rock when it flies past the Earth in 2029. And that’s what it’s all about: lead time. If mankind spots a potentially deadly asteroid approaching us, we’ll need as much time as possible to nudge it off course.